This report focuses on investment in eight EU Member States and their lagging regions. Additionally, the analysis assesses the regional development strategies of the eight Member States and evaluates the main investment needs and complementary alternative support options of the lagging regions over the next ten years. The analysis is performed in two steps. The first step identifies the investment needs of the lagging regions from the countries’ own as well as from a European perspective. It analyses to what extent and in what form investments in the lagging regions have to be supported in order to satisfy the needs. 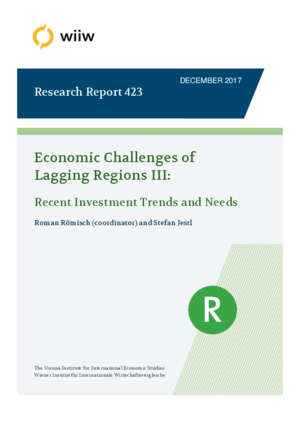 The identification of investment needs is approached from two sides, a) the countries’ own assessments of investment needs and b) a comparative analysis of the lagging regions with more prosperous EU-28 regions that had similar economic development characteristics as the (Southern) lagging regions. The second step analyses the main national and regional investment trends over the last 10-15 years, and covers different types of investment, depending on whether they are seen from a National Accounts, European or international perspective.